During winter, when the sky is clear, we can often witness northern lights above Whitehorse, YT. I wanted to capture these aurora events and share them with family and friends so I decided to create a camera that would live stream a view the sky on the internet. I borrowed the idea from AuroraMax but I didn’t want to spend too much money in the construction so I chose to use a small USB camera instead of a large and expensive DSLR. 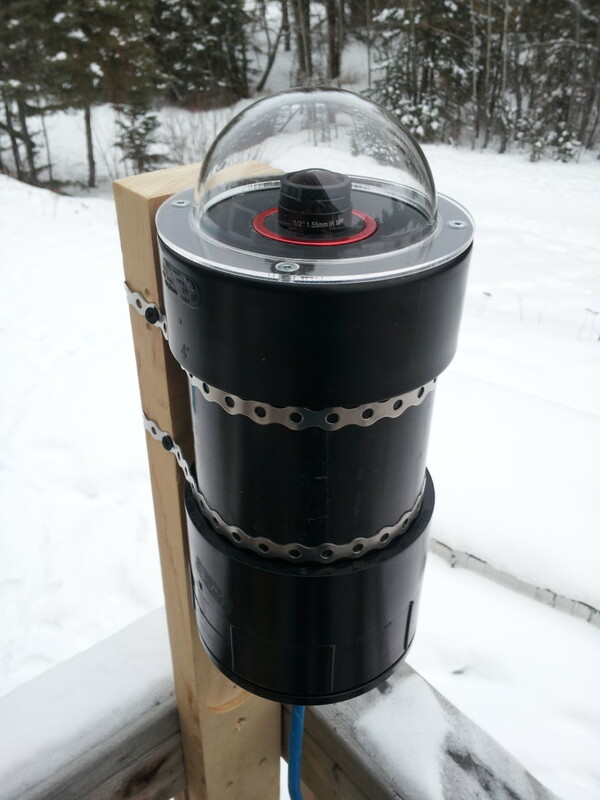 I was inspired by Martin Lewis all sky camera which he built using an ASI120 astronomy camera. This camera uses USB to communicate with a computer. The maximum length for USB 2.0 cables is around 5m. This means that your camera can’t be more than 5 meters away from your computer. This is somewhat limiting when you want to put a camera on a roof. 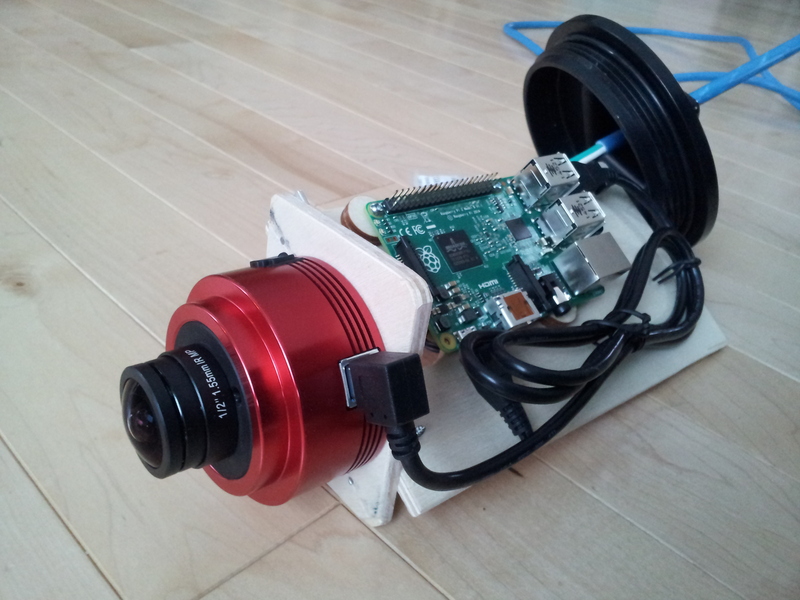 Instead, I decided to bring the computer inside the camera enclosure by using a small but fairly powerful computer. i.e. a Raspberry Pi 2. I added a USB wifi dongle to transfer images from the computer to the wireless router. The enclosure of the camera consists of a 4″ ABS pipe with 1 end cap and 1 threaded end cap. A hole is cut in the top one to accommodate the lens and an acrylic dome is screwed over the lens. The bottom cap can be open to access the computer and camera. Only a main power cable comes out of the camera. The maximum distance of the device is only dictated by the range of your wifi. The camera starts at civil sunset, captures a 5second exposure image every 10 seconds and uploads it to a page on this website. It stops the capture at civil sunrise. 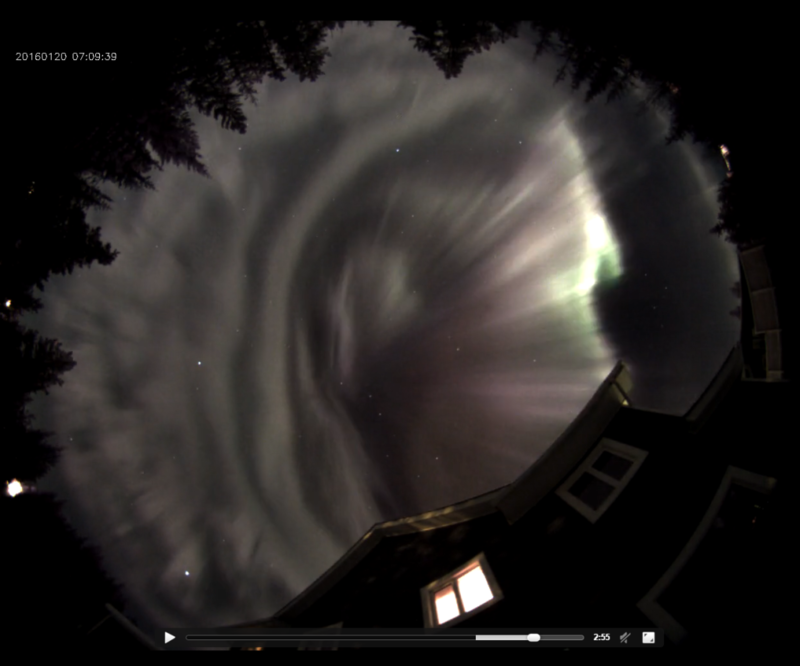 After that, it generates a time lapse video of the night and uploads it as well. This is an example of what a time lapse looks like. This is a very impressive build! I wish I had saw this before I started my build although I saw some similar. I too am using the ASI224mc with the stock fish-eye lens that cam with the camera. I have used a pvc weatherproof enclosure box from Lowes with an added acrylic dome, a thermostatically controlled brush-less fan and heater. At the moment it is usb wired to a desktop just inside my roll off roof observatory. I am having to use a program called HANDYAvi for camera control which works pretty well but I don’t seem to get quiet the clarity that you are, due to different codecs possibly. I would be interested to discuss your project more if you like. I have been in talks with CAMS and SkySentinel, both NASA network meteor monitoring projects. Currently they use CCTV cameras but seem to be interested in the progress of the ASI cameras. I would just forwarded information about swedish and croatian team that are using the ASI cameras with raspberry Pi’s much like yours. So my second build will hopefully be based on that since it will allow the collection of scientific data besides just imaging. Would you be interested in collaboration as I attempt to move forward with the CAMS and Skysentineal teams. Im wondering if this projects software can be made to work with imaging source cameras? or other ASI cameras? In theory, this could work with anything producing an image. The only code that is specific to ZWO cameras is in capture.cpp. It uses ZWO’s function calls to talk to the camera but other manufacturers provide their own SDK so we could have a capture_qsi.cpp, capture_zwo.cpp, capture_imaging_source.cpp, etc. The only problem is that I only own a ZWO camera so I can’t test the software for the other cameras. Interesting, thanks for the quick reply. I assume other ASI cameras can be added as well, I only saw a couple models when I looked in github. Ill try to play with it and my ASI1600MM (not that I would use that camera for an all sky!). Very interesting project, thanks for all your hard work! I too have an All Sky Camera with an imaging source (DFK) camera, but run software on a PC to capture and upload my images. I have a ASI120MM, so might try that on a PI. The only PI I have here is a model 1 B, will that work or do I need a PI2? The software works on armv6 and armv7 architectures so you’ll need at least a Pi2. It “may” work on a Pi1 but I don’t have one at home so I can’t confirm it would compile properly. Wow! That’s just phenomenal. What do you suggest a beginner in skycam start with? Do you mean in terms of equipment or targets to look for? You can easily use the camera to monitor a location (observatory for example). The keogram and startrails features of the software will give you a quick way to detect cloud cover and meteors. You can also see them using the GUI under the images tab. No there’s nothing to do to enable the picture saving as long as your GPS coordinates are correct. The system should calculate when night starts and then start the saving process at the same time. Saving stops at sunrise. Hello, I must first congratulate you and thank you for the work done and sharing. I am an astrophotographer in France and realized last week your Allsky camera. However I will need help once again, how to create the site visible from anywhere. I must specify that I am a beginner in Raspberry …. etc .. If you had the agility to guide me it would be great !! but what you have done is already huge !! Also, very nice work on the Strock-250. It reminds me of the one I built a while ago. And superb photos of the galaxies. M51, M101 and NGC4565 are my favourite targets. I haven’t really started serious astrophoto but it’s nice to see what can be done! Thank you for your passage on my site !! it is true that the strock 250 is a marvel !! to be able to observe the universe with an instrument made of these hands is great !! Well I really have a lot of questions about your allsky !! and what I would like to have, and if in addition I could add a small station eteo like Mweather it would be top and even my AAG cloudwatcher !! But, and there is always a but !!! I am unable to do this on my own, I saw your page (https://github.com/thomasjacquin/allsky-website) but I am unable to do something! would you be leaving to guide me? thank you very much for everything you have done !! All you have to do with the allsky-website project is to download it and upload the files to your server. You can create an “allsky” directory and put everything in there. You’ll have to edit config.js to match your location. Then you can edit scripts/ftp-settings.sh on the raspberry pi to make the upload happen. That should be all you need to do to get it to work. Hello Thomas, it seems so simple !! but for me it is not necessarily. onc i have to take another raspberry to make a server, or i have to do it on the raspi of the allsky? if I have to mount another RPI what kind of server? a recommended tutorial?